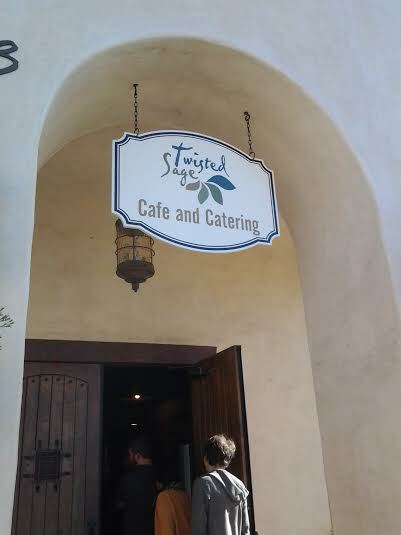 Twisted Sage Cafe, 433 E. Foothill Blvd. (at Dixie), San Dimas; open daily 6 a.m. to 3 p.m.
You may have to twist your car a couple of times to find Twisted Sage, which is in a white Spanish-tile office complex a few blocks west of San Dimas Canyon Road. But my friends and I did a U-turn one recent Sunday and circled back. 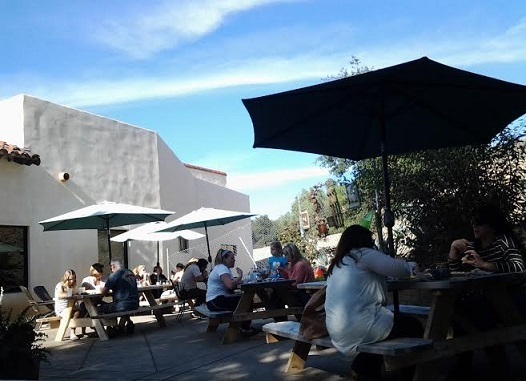 Twisted Sage is a popular spot, and for good reason, one of those rare places out here that does what so many hip spots in LA do: local produce, sustainable, green practices, reclaimed wood, made from scratch, etc., etc. People were lined up out the door to order at the counter; there proved to be exactly the right number of tables. 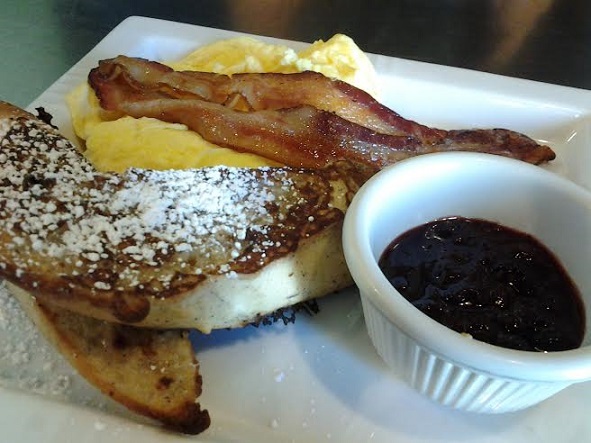 We had a French toast plate ($8, below), which uses French bread and comes with homemade jam; bacon waffle ($5.75), slices of bacon surrounded by waffle; and veggie wrap ($8), wrapped in a spinach tortilla, with a side of mac and cheese ($1.50). We weren’t wowed, but we liked our meals. The ambience is lively: forest green walls, stainless steel tables and chairs, salvaged decor, interesting accent pieces. I returned for lunch a couple of weeks later. 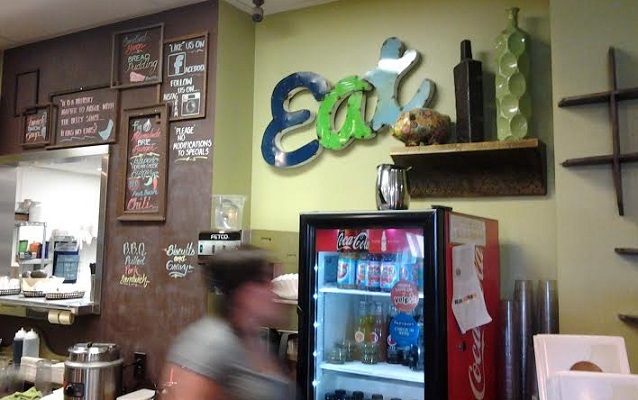 The menu has salads, sandwiches, panini and wraps, as well as a few specials, recently including a couple of burgers. 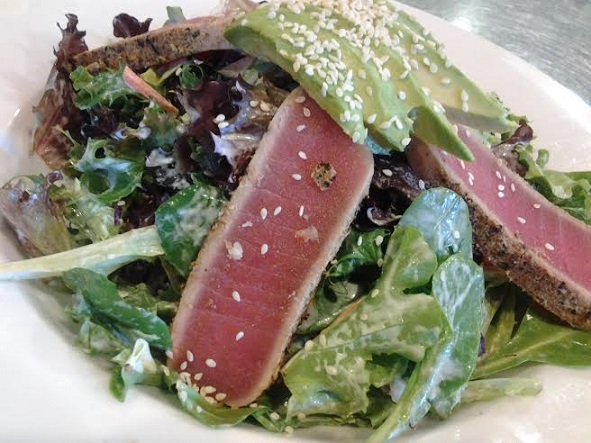 I got the seared ahi tuna salad ($15, middle). Besides four thick slices of tuna, the salad has mixed greens, slaw, cucumber, radish, avocado and a cucumber wasabi dressing. I would have preferred a vinaigrette to a cream dressing, but the salad was good. After hearing good things about the biscuits and gravy, I came back for breakfast and got that as a plate ($11, bottom). 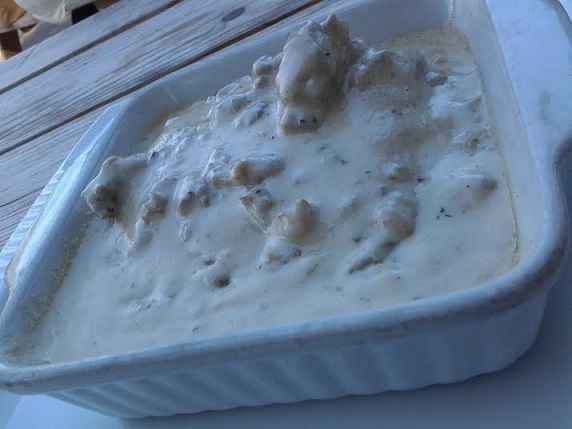 I don’t typically like biscuits and gravy, as the sauce is like a white mass of goop to me, but the Twisted Sage version was delicious: a cornbread-like biscuit topped with housemade-sausage gravy. They’re not on the regular menu, but they’ve been offered as a special in recent weeks. They came with eggs, crisped potatoes and bacon. Delicious. I felt like I’d finally ordered the right thing. I ate on the rear patio, which I didn’t know existed on previous visits, picnic and bistro tables arrayed in a relatively secluded spot. Ultimately, then, a thumb’s-up for Twisted Sage. The concept may outpace the results at times, but I like the concept, and you might too.